The hilarious follow-up to bestselling The Fix – gangsters, murder and a multitude of sarcasm await… who will die first? I was given this book by Caffeine Nights Publishing in exchange for an honest review. The characters in this book truly stand out and have a life of their own. Each had substance and could easily steal the show from each other. In fact, for me, they were all so well developed that I could see each having their own spin-off novel. David Brodie really struck a cord with me. A down and out journalist who seems to have a death-wish. This guy does not give a sh*t whether or not he lives to see the next day…but then he comes across a story which could literally change his life. Konstantin is also a character who has a lot of layers. And Lucy…I adored her for some reason…as you learn more about her, there is just something niggling in the back of your mind which makes you think we still have not had the full picture. I also loved the humour in this book. Brodie is brilliant for his sarcasm and one-liners. I laughed quite a bit! The book was full of twists which I did not expect. The only thing that, for me, did not make it a five-star read was the chaos/ pace which although it was good– at times made the story feel a little dis-jointed. I have to admit, I got a bit lost and would have to go back to see had I inadvertently missed something. Also, although this book easily reads as a stand-alone I think I may have been better off reading The Fix first as it was clear Konstantin was a character who had more to him but this book felt like it just scratched the surface for me. 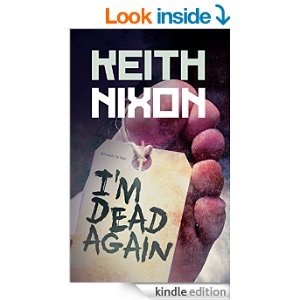 All in all I thought this was a great book and I will definitely be reading more from Keith Nixon. I highly recommend this read. Click the link below to pick up your copy!